Nefertiti was an Egyptian queen and wife of King Akhenaten who remains a mystery to scholars today. A bust (sculpture of a person's head and shoulders) of her discovered in 1913 is one of the most widely recognized symbols of ancient Egypt. 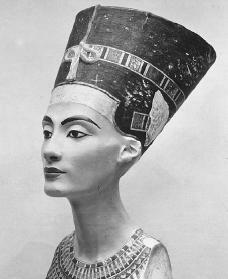 Nefertiti was born around 1390 B.C.E. Some believe she was of Egyptian blood, while others believe she was a foreign princess. Her name, which means "the beautiful one is come," is of Egyptian origin, and evidence indicates that she had an Egyptian wet-nurse or governess of noble rank, which has led to the belief that she was born within the circle of the Egyptian royal court. She may have been a niece or daughter of Ay, who was a keeper of records under King Amenhotep III. similar to those of the king—acts quite unlike those usually performed by previous chief queens, all of whom had a secondary role. In the fifth year of his reign, Amenhotep changed his name to Akhenaten. He went against the beliefs of previous kings by announcing that the sun god Aten was the greatest of all Egyptian gods and the only one who should be worshipped, rather than Amen-Ra, who had long been considered supreme. Nefertiti shared his belief. Largely because of opposition over this issue, Akhenaten built a new capital called Akhetaten and moved the royal family there. After the fourteenth year of Akhenaten's rule, there are no more pictures of Nefertiti; she simply disappears from view. Some believe she was the power behind the throne and thus responsible for the changes during the rule of Akhenaten until being dismissed from her position and banished to the North Palace at Amarna. This would mean there was a conflict within the royal family, with Nefertiti favoring the continued worship of Aten while Akhenaten and his son-in-law Tutankhamen (c. 1370–c. 1352 B.C.E. ) supported a return to the worship of Amen-Ra. Most scholars, however, now suppose that Nefertiti's disappearance may simply be due to the fact that she died, and one of the king's other wives took her place at his side. A more dramatic, if less accepted, theory holds that she assumed a new, masculine identity toward the end of Akhenaten's rule—that Nefertiti and the young Smenkhkare, who ruled briefly either with or after Akhenaten and is believed by some to have been his son, were in fact the same person. Freed, Rita E., Yvonne J. Markowitz, and Sue H. D'Auria, eds. Pharaohs of the Sun. Boston: Little, Brown, 1999. Tyldesley, Joyce A. Nefertiti: Egypt's Sun Queen. New York: Viking, 1998.
u guys rock u helpd me with my homework a lot thanks!!!! You know two of Nefertiti's daughters died at birth. that helped me alot thanks!!!! it was kinda short but it had things that other sources dont have. Thanks alot helped me with my report on Queen Nefertiti!!!! Thanks you so much!!!! this helped me with my report on Queen Nefertiti!!!!!!!!!!! hopefully i will get an A! It has recently come to light that the mummy of Nefertiti was discovered and through analysis was found that she was murdered. Most theorize that after the death of Akhenaten Nefertiti became Pharaoh and moved the capital back to Thebes. There is some support in the belief that Nefertiti was murdered by the Priests of Aten since she returned worship back to Amun. i think that that article is kinda odd. I was told that Nefrititi once ruled on her own. And it would be nice if there was some thing on her death and where she may be today. A Very Stressed Out Student Until I Found This! thank you so much for this biography i couldnt find anything until this website! i was so stessed out and then this website totally saved me! THANKS! u guys really helped me w/my soc stud project! thnx! info too short & need more information on this person, it would be appreciated very much!! I had heard there was a ring discovered that linked the names of Smenkhkare and Queen Nefertiti. Also, Tutankhamen was actually King Akhenaten's son. from the queen and king or a guy in their army. oh,and also people never found her body. it was very useful but it shoul have stuff about her family as well. maybe more colour too. i really like this website because its useful and i think its very helpful. maybe it could have a bit more colour too. Nefertiti had six daughters and maybe one son. I hope I get a a on my test,But why should I belive all this info I have been to other websites and cant find anything on that bluecrown put something like that in there and maybe I will try it again but I and us need to know why this info is true and not it being that you put anything you want in here thank you for reading this and please consider what I have to say.